Welcome to the Ultimate Guide to Batting Cage Turf. With a wide variety of sports turfs available in the market, finding the right turf for your cage can be confusing. Whether your batting cage is in a basement, pole barn, or commercial facility, or baking in the sun out in the backyard or facing brutal winds at the ball field, this guide will help you find the perfect turf for your batting cage. This is batting cage turf made easy. Covering a few artificial turf basics will help save you time in your search. Artificial turf is usually made of either nylon or poly materials. Nylon is more durable than poly, and considered spike-resistant. 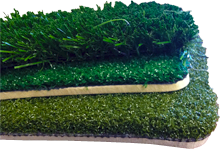 Some artificial turf, like our own Sportscape IV, features a blend of nylon and poly materials. This blend of turf materials at differing lengths gives the turf the most realistic feel on the market. Protip: If your players wear spikes on the turf, you need nylon. How thick should your turf be? The thicker the turf, the more durable it is. Here’s the secret. The thickness of the turf face is measured in ounces. The higher the number, the thicker the face, the more durable the turf. We usually recommend a minimum of 30 ounces for batting cages. Our favorite turf materials have a 42 ounce face, just like the most popular pitching mounds and mats on the market. Now that you’ve got some artificial turf basics under your belt, let’s take a look at the different styles of turf available for your cages. 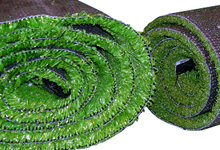 Most turf rolls are available in 12 or 15 foot widths, and can be cut to any length. (Many turf shops have a square footage minimum to meet.) In most cases, you’ll want complete coverage of your cage’s footprint to help prevent tripping hazards inside the cage. Protip: If you’re looking for a turf that’s spike-resistant, be sure to choose nylon, which is more durable than poly. The thickness of the turf face also contributes to the lifespan of the turf. Face thickness is measured in ounces. Remember, the higher the number, the thicker the turf, the more durable the turf. We always recommend a minimum of a 30 oz face for batting cages. Our most popular turf is 36 ounce nylon, and we really love the 42 ounce nylon turf, since batting cages see a lot of foot traffic. Let’s talk about padded turf. We always recommend using a padded turf in batting cages. Your feet don’t like. When you step on turf, your feet know instantly whether there’s a pad underneath. Padded turf doesn’t just feel great underfoot, it also helps cut down on the potential for ricochet. If you’re slapping unpadded turf down on a concrete pad, you might as well not have any turf at all. Protip: Having your turf wider and longer than the footprint of your cage will help reduce tripping hazards inside the cage. Bonus Protip: Padded turf is safer. It feels great underfoot, and cuts down on potential ricochets. Batting cages are perhaps the most heavily trafficked sports turf application. And inside the cage, the batter’s box area sees the most action. 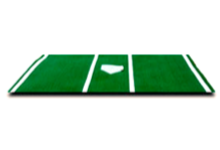 A turf mat with inlaid batting cage can really save on the wear and tear of your batting cage turf. 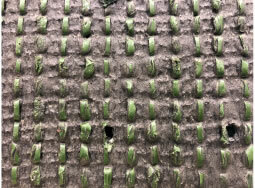 Instead of having to replace the entire roll, for a fraction of the cost you can simply replace a worn turf mat with a new one. 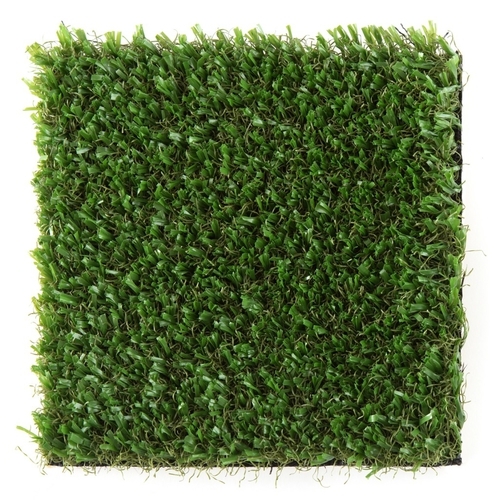 Turf mats are generally available in two colors, green and clay. We love the look of a clay mat on a green turf roll. It helps the batters box ‘pop’ against the green background, and it gives a more realistic look. 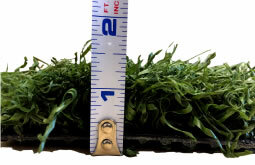 Turf mats are available in two sizes, 6 feet x 12 feet and 7 feet x 12 feet. We like the 7 x 12 foot mats because that extra weight seems to help keep the mat in place a little better. Most mats also have the option for a painted home plate or an inlaid home plaid. 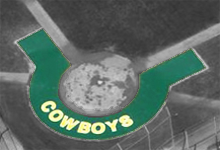 An inlaid home plate means that the turf itself is white, not just green turf painted white. The inlaid plate usually has an added cost, but it’s minimal, considering the plate will last the lifetime of the turf. Turf mats can slide around on top of your turf roll. If this happens to you, a little 2-sided seaming tape can help keep it in place. Protip: Make a cut-out in your turf roll to the dimensions of your turf mat, and secure your mat level with your turf roll. Not only will the mat look great (especially if it’s clay colored), but the mat won’t slip. And since it’s level with the turf roll, it won’t be a potential trip hazard. As used turf becomes more widely available, and more economical, we think it makes a great turf for batting cage use. However, there are a few important things you should know about used turf before you buy. Used turf is sold as is. And it’s not going to be perfect. You can expect to see tears and worn spots in your turf. A lot of used turf doesn’t even arrive on rolls. Just because it doesn’t look great on the back of a flatbed truck, doesn’t mean it won’t look great lining your batting cage. Protip: Once you unload the turf and lay it out flat cuts can be repaired simply with 2-sided seaming tape. Be sure to ask your used turf supplier if the infill is included. Some turf removal companies remove the infill when they remove the turf, some don’t. There’s pros and cons to both. Having in-fill means you won’t have to source your own infill and rake it in. but it also makes the turf very heavy. Turf with the infill included may be so heavy you it requires a fork lift to unload. Used turf will have lines and logos. A good used turf supplier should be able to tell you what type of field the turf was pulled up from, which can give you an idea on what kind of lines to expect. While not technically batting cage turf, it’s worth talking briefly about pitching mounds and halo kits. If you’re looking to purchase a pitching mound, be sure it has a minimum of 42 ounce nylon, because those mounds will take a lot of abuse. 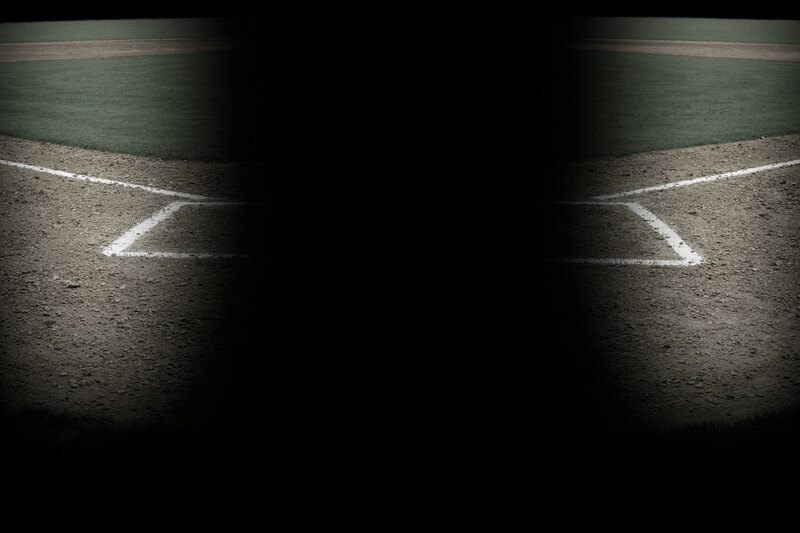 Turf Halo Kits are designed to be installed around the batter’s box of a baseball field to help reduce maintenance to that heavily trafficked area. They can be installed on a concrete pad, or over a crushed rock base. A lot of our customers ask if they can use padded batting cage turf outdoors. But there are a few actions you can take to give you the best experience with your outdoor batting cage turf. 1. Punch holes in your turf and pad to help with drainage. 2. Install a crushed rock base to help water flow through the turf and in to the rock and soil below. 3. ‘Crown’ the crushed rock surface to allow water to run off the face of the turf. (Crowning refers to giving your turf base a slight hump in the middle so that water moves away and down from the middle of the turf. Both poly and nylon turfs can be used for outdoor batting cages. We always recommend the durability of nylon for outdoor use, because outdoor cages are more likely to see the use of spiked shoes. Remember: Nylon turf is spike-resistant. Poly turf is not. That was batting cage turf made easy. Now that you’re armed with batting cage turf knowledge, you can fearlessly navigate our turf rolls and turf mats. If you have any questions, please leave a comment below. We’re always happy to help. Become a Practice Sports Member. Save on your first order and receive exclusive promos for future purchases. What’s the benefit of using artificial turf over other flooring options for indoor use? Turf is be far the superior option for baseball use in indoor settings. In most cases, the turf will be installed over concrete so the turf will offer some shock absorption if being used for other activities. Also, the surface will protect your baseball and/or softballs from getting damaged by hitting the floor. Is there a difference between indoor and outdoor turf? There is no difference between indoor and outdoor turf. Any turf can be used for either application. Are all turfs cleat and spike resistant? No, not all turf is spike and cleat resistant. Thicker poly materials with foam padding will be cleat resistant. The nylon materials with foam padding (Grand Slam Nylon Deluxe) are spike resistant. All turf is treated with UV inhibitors so it will not fade over time. What turf roll sizes are available? The standard widths on most rolls is 15’W. There are a few that come in 12’W rolls. You can pretty much get any length you’d like. There are limitations on the lengths due to transport and mobility issues once you get the turf on site. Can I get a turf roll smaller than the standard width? Unfortunately, these rolls cannot be but prior to shipment on the width. The rolls will have to be cut on site if you wanted to cover a smaller area, for example shorter than the standard 15’W or 12’W rolls, the turf will have to be cut on site. Does water drain through the turf? Drainage holes are not included in the turf but you can use a drill bit and drill your own drainage holes on site. You don’t need to drill a ton of holes in the turf. Just a few every 5′ or so to create drainage points. Can I install this turf myself? Yes, you can install the turf yourself. It is recommended to use an adhesive to glue the turf down. If being used for just baseball & softball activities, you can just glue the perimeter but if you plan on using the turf for agility training it is recommended to glue the whole turf down. Any all weather urethane compatible adhesive will work. This entry was posted in Halo Kits, Putting Greens, Turf, Turf, Used Turf, Used Turf, Used Turf and tagged batting cage turf, outdoor batting cage turf, turf, turf mat, used turf. Bookmark the permalink. Follow any comments here with the RSS feed for this post. Post a comment or leave a trackback: Trackback URL.